The FDA has approved Roche’s VENTANA PD-L1 (SP142) Assay as the first companion diagnostic (CDx) authorized for the combination therapy of Tecentriq® (atezolizumab), marketed by Genentech, a member of the Roche Group, and Celgene’s chemotherapy Abraxane® (paclitaxel protein-bound particles for injectable suspension [albumin-bound]; nab-paclitaxel), Roche said today. Launched in 2016, the VENTANA PD-L1 (SP142) Assay was the first to evaluate patient PD-L1 biomarker status using immune cell staining and scoring within the tumor microenvironment, according to Roche Diagnostics—which hailed the FDA approval as an “important step” in its personalized healthcare strategy. VENTANA PD-L1 (SP142) was developed to enhance visual contrast of tumor-infiltrating immune cell staining. PD-L1 is primarily expressed on tumor-infiltrating immune cells rather than on tumor cells themselves in triple-negative breast cancer. The assay previously won FDA approval and received CE marking in Europe for use as a CDx in urothelial carcinoma (UC), and as a predictive assay in second-line non-small cell lung cancer (NSCLC) with Tecentriq. However, in Switzerland, Tecentriq is approved for NSCLC only. Approval for the assay comes in addition to the FDA’s approval for the Tecentriq-Abraxane combination as the first-ever immunotherapy regimen approved for breast cancer. 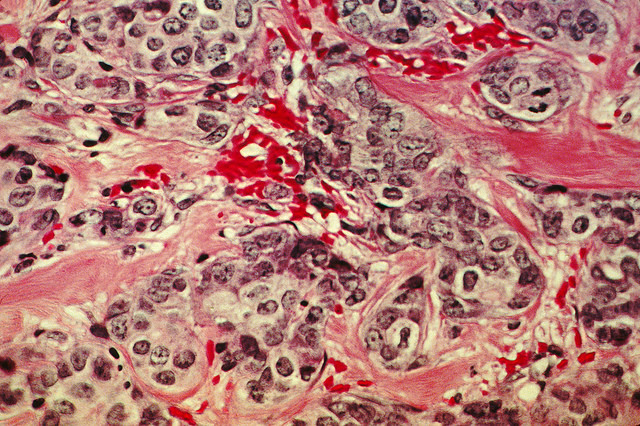 Tecentriq-Abraxane was approved as a treatment for adults with unresectable locally advanced or metastatic triple-negative breast cancer (TNBC) in patients whose tumors express PD-L1, as determined by an FDA-approved test. “This Tecentriq combination is the first cancer immunotherapy regimen to be approved in breast cancer, representing a meaningful step forward in the understanding of this disease,” Sandra Horning, MD, Genentech chief medical officer and head of Global Product Development, said in a statement. “The FDA approval of this Tecentriq combination is an important treatment advance for people with PD-L1-positive, metastatic triple-negative breast cancer, a disease with high unmet medical need,” Horning added. The FDA granted accelerated approval to the Tecentriq-Abraxane combination a day ahead of its PDUFA or Prescription Drug User Fee Act target date for a decision. Through its Accelerated Approval Program, the FDA allows conditional approval of a medicine deemed to fill an unmet medical need for a serious or life-threatening disease or condition. Genentech said a study to confirm clinical benefit for Tecentriq-Abraxane is ongoing. Continued approval for the indication may be contingent upon verification and description of clinical benefit in the confirmatory trial, the company acknowledged. The FDA based its decision on positive progression-free survival (PFS) data from the Phase III IMpassion130 trial (NCT02425891)—which, as with other Tecentriq clinical trials, used VENTANA PD-L1 (SP142) to enroll and stratify patients. The VENTANA PD-L1 (SP142) Assay is the primary diagnostic assay within the Tecentriq clinical development program. Data from IMpassion130 showed that Tecentriq plus nab-paclitaxel significantly reduced the risk of disease worsening or death by 40% compared with nab-paclitaxel alone—a median PFS of 7.4 months, vs. 4.8 months—in PD-L1-positive patients with unresectable locally advanced or metastatic TNBC who had not received prior chemotherapy for metastatic disease. IMpassion130 was designed to assess the efficacy, safety, and pharmacokinetics of Tecentriq plus Abraxane compared with placebo plus Abraxane in patients with unresectable locally advanced or metastatic TNBC who have not received prior systemic therapy for metastatic breast cancer. The trial enrolled 902 people who were randomized equally (1:1). The co-primary endpoints of IMpassion130 were PFS per investigator assessment (RECIST 1.1) in the ITT (intent-to-treat) population and in the PD-L1-positive population and overall survival (OS) in the ITT population. Secondary endpoints included objective response rate and duration of response. OS results were “immature,” Genentech said, with 43% of events in all randomized ITT patients. Further data will be shared with the FDA and presented at an upcoming medical meeting, the company added. Safety in the Tecentriq plus nab-paclitaxel arm appeared consistent with the known safety profiles of the individual medicines, and no new safety signals were identified with the combination, according to Genentech. The most common side effects (≥20%) were hair loss, feeling tired, tingling or numbness in the hands and feet, nausea, diarrhea, low red blood cells, constipation, cough, headache, low white blood cells, decreased appetite, and vomiting. Among Grade 3–4 side effects (≥2%) seen with Tecentriq plus Abraxane, Genentech said, the most common were low white blood cells, tingling or numbness in the hands and feet, neutrophil count decreased, feeling tired, low red blood cells, low blood potassium level, pneumonia, and increased blood level of a liver enzyme (AST). “Chemotherapy alone has been the mainstay of treatment for many years, so it’s encouraging to now have an immunotherapy combination available for people with PD-L1-positive disease,” added Hayley Dinerman, executive director of the Triple Negative Breast Cancer Foundation.